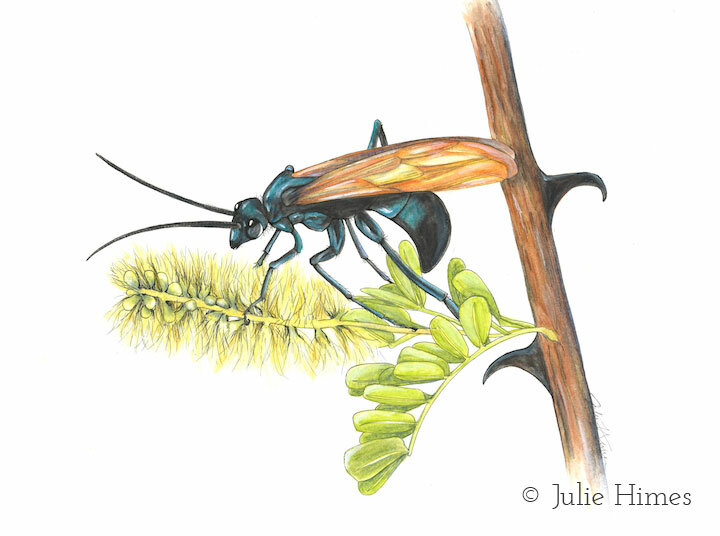 This is the catclaw acacia (Acacia greggii) being visited by the tarantula hawk wasp (Pepsis spp.) in the Mojave National Preserve. Catclaw acacias are winter deciduous shrubs that form leaves, then flower in the summer, and is the primary source of food for a large array of local pollinators. With a nearly 10 mm long stinger, the tarantula hawk is known for having one of the most painful stings in the world, second only to the bullet ant. The wasp derives its name from the way it reproduces. The wasp attacks and lays its eggs inside tarantulas. The larvae incubate within the tarantula and kill it upon emergence, using the body for sustenance.